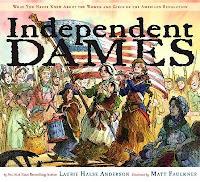 Independent Dames: What You Never Knew About the Women and Girls of the American Revolution by Laurie Halse Anderson, illustrated by Matt Faulkner. Grades 2-6. Simon & Schuster Children's Publishing, June 2008. Review copy provided by my local library. You know about Paul Revere and his ride, right? Well, did you know that during the American Revolution, 16-year-old Sybil Ludington rode 40 miles through the night to warn American militia of a British attack? Yeah, Paul Revere's ride was 16 miles. Or how about Prudence Wright and Sarah Shattuck who led a group of women that captured a British spy as they guarded their village after the men were called off to a battle? Ever heard of them? No? Well, have you heard of Elizabeth Burgin who led 200 American prisoners of war to escape from a British ship by crossing the frozen New York Harbor? She had to flee when the British put a price on her head. Did you know? If not, you should pick up Independent Dames by Laurie Halse Anderson. In this book, Anderson provides brief facts about many, many of the women who spied, protested, collected goods, nursed, fed, donated, and fought during the American Revolution. Women wanted freedom, too! And women contributed to the Revolution in many different ways, documented in this book. The text and illustrations have much for kids to pore over. In addition to the main text, there are sidebars highlighting the contributions of specific women and a time line runs on the bottom of the pages, chronicling the path of the Revolution. Little jokes are set into the illustrations with cartoon speech bubbles. I can certainly see kids coming back to this book again and again to glean facts about these extraordinary women. Anderson rounds out the text with a large bit of information at the end of the book, including a discussion of some of the myths (or possible myths) of women in the revolution. For example, "Betsy [Ross] was an upholsterer who sewed tents and uniforms for the Continental army, but her involvement with the first flag is questionable." (pg 36) Brief sections at the end of the book also talk about Loyalists, African-Americans, and Native Americans. Anderson includes an author's note (and Faulkner includes an illustrator's note) as well as a substantial bibliography. This book will add much to units on Women's History and the study of the Revolutionary War. It's a great one to have on your home or classroom shelves for kids to come back to again and again. Due to the sheer volume of facts, kids may not sit down and read this one cover to cover, but the format makes it easy for them to pick up and put down the book at will. Read more reviews at The Reading Zone and The Imperfect Parent Bookshelf. And hey, happy Nonfiction Monday, all. Simply Science has the roundup this week. another great post! I saw this at the book store and it is a little young for our middle schoolers but I will see if we can order it for the public library I work at. It sounds like a wonderful book. Thanks for the great post. This book sounds perfect for what I need.